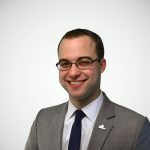 The author would like to thank Zachary Bartsch for his assistance on this report. The five states with the highest average combined rates are Tennessee (9.44 percent), Arkansas (9.18 percent), Louisiana (8.89 percent), Washington (8.87 percent), and Oklahoma (8.72 percent). The five states with the lowest average combined rates are Alaska (1.69 percent), Hawaii (4.35 percent), Maine (5 percent), and Wisconsin (5.43 percent), Wyoming (5.50 percent). The highest total sales tax rate in the United States is in Tuba City, Arizona, which has a combined rate of 12.725 percent. This rate is composed of a 5.6 percent state tax, a 1.125 percent Coconino county tax, and an additional 6 percent tribal tax levied by the To'Nanees'Dizi local government. California, which raised its sales and income taxes through the initiative process in November of 2012, has the highest state-level rate at 7.5 percent. Five states tie for the second-highest statewide rate with 7 percent each: Indiana, Mississippi, New Jersey, Rhode Island, and Tennessee. Arizona, by contrast, cut its rate from 6.5 percent to 5.5 percent as a temporary sales tax increase expired, and Kansas moderately cut its statewide sales tax rate from 6.3 percent to 6.15 percent. The District of Columbia is scheduled to lower its sales tax from 6 percent to 5.75 percent on October 1, 2013. 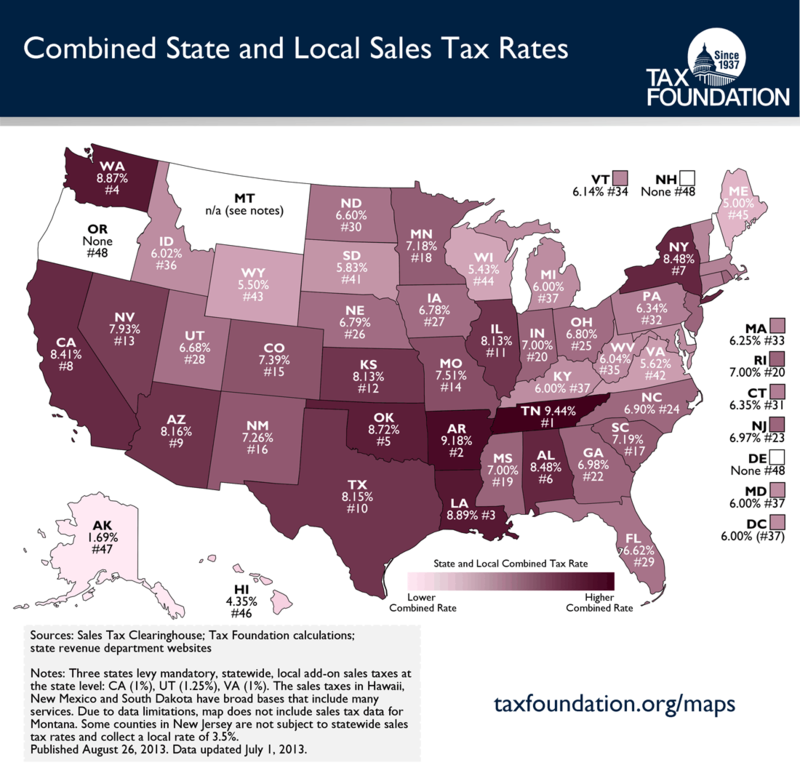 The five states with the highest average local sales tax rates are Louisiana (4.89 percent), Colorado (4.49 percent), Alabama (4.48 percent), New York (4.48 percent), and Oklahoma (4.22 percent). Mississippi has the lowest non-zero average local rate of 0.004 percent, attributable to the state's only local sales tax: a 0.25 percent sales tax in Tupelo, the birthplace of Elvis Presley, with a current population of 35,490. The highest local rates are in Homer and Seldovia, Alaska, and Snowmass Village, Colorado (7.5 percent), Tuba City, Arizona (7.125 percent), and Seward and Wrangell, Alaska; Brookwood, Alabama; and Lake Providence, Louisiana (7 percent). Avoidance of sales tax is most likely to occur in areas where there is a significant difference between two jurisdictions' sales tax rates. Research indicates that consumers can and do leave high-tax areas to make major purchases in low-tax areas, such as from cities to suburbs. For example, strong evidence exists that Chicago-area consumers make major purchases in surrounding suburbs or online to avoid Chicago's 9.25 percent sales tax rate. At the statewide level, businesses sometimes locate just outside the borders of high sales tax areas to avoid being subjected to their rates. The state of Delaware actually uses its state border welcome sign to remind motorists that Delaware is the "Home of Tax-Free Shopping." State and local governments should be cautious about raising rates too high relative to their neighbors because doing so will amount to less revenue than expected, or in extreme cases, revenue losses despite the higher tax rate. The taxation of services and business-to-business transactions also vary widely by state. Experts generally agree that Hawaii has the broadest sales tax in the United States, taxing many products multiple times and, by one estimate, ultimately taxing 99.21 percent of the state's personal income. This base is far wider than the national median, where the sales tax base applies to 34.46 percent of personal income. It should also be noted that while the Census Bureau reports population data using a five-digit identifier that looks much like a ZIP code; this is actually what is called a ZIP Code Tabulation Area (ZCTA), which attempts to create a geographical area associated with a given ZIP code. This is done because a surprisingly large number of ZIP codes do not actually have any residents. For example, the National Press Building in Washington, D.C., where the Tax Foundation is located, has its own ZIP code solely for postal reasons. Of course, sales taxes are just one part of an overall tax structure and should be considered in context. For example, Washington State has high sales taxes but no income tax; Oregon has no sales tax but high income taxes. While many factors influence business location and investment decisions, sales taxes are something within policymakers' control that can have immediate impacts. (b) Three states collect a separate, uniform "local" add-on sales tax: California (1%), Utah (1.25%), Virginia (1%). We include these in their state sales tax. (c) The sales taxes in Hawaii, New Mexico, and South Dakota have broad bases that include many services, so their rates are not strictly comparable to other states. (e) Some counties in New Jersey are not subject to the statewide sales tax rate and collect a local rate of 3.5%. Their average local score is represented as a negative. To'Nanees'Dizi Local Government Sales Tax Return, TC-FORM 600, http://www.tndtaxcode.com/forms/amended_FORM_600_07-12-11.pdf. See also Vertex Inc., 2012 Sales Tax Rate Report, http://www.vertexinc.com/pressroom/2013/Vertex%20Inc%20-%202012%20Sales%20Tax%20Rate%20Report.pdf. This number includes a mandatory 1 percent add-on tax which is collected by the state but distributed to local governments. Because of this, some sources will describe California's sales tax as 6.5 percent. A similar situation exists in Utah and Virginia. Andrea Noble, D.C. Council votes to lower sales tax, Washington Times, June 26, 2013, http://www.washingtontimes.com/news/2013/jun/26/dc-council-votes-to-lower-sales-tax/?page=all. U.S. Census Bureau, Annual Estimates of the Resident Population for Incorporated Places: April 1, 2010 to July 1, 2011, http://www.census.gov/popest/data/cities/totals/2011/SUB-EST2011-3.html. Len Lazarick, Raise taxes, and they'll move, constituents tell one delegate, Marylandreporter.com, Aug. 3, 2011, http://marylandreporter.com/2011/08/03/raise-taxes-and-theyll-move-constituents-tell-one-delegate/. For a list, see Tax Foundation, 2013 State Business Tax Climate Index, Tax Foundation Background Paper No. 64 (Oct. 9, 2012), https://taxfoundation.org/article/2013-state-business-tax-climate-index. For a representative list, see Tax Foundation, 2013 State Business Tax Climate Index, Tax Foundation Background Paper No. 64 (Oct. 9, 2012), https://taxfoundation.org/article/2013-state-business-tax-climate-index.